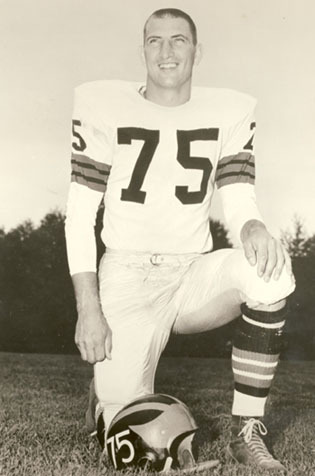 Norm Fieldgate and Canadian Football Hall of Fame member By Bailey were the only two players from the original BC Lions team of 1954 who were still with the club when they celebrated their first grey cup victory 11 years later. Fieldgate played 223 games at Offensive End, Defensive End, Corner Linebacker, and Defensive Back. What he lacked in physical stature, he made up for in pure talent. He was considered one of the best Canadian corner linebackers to have played the game. A perennial All-Star, Fieldgate was honoured by the citizens of Vancouver at “Norm Fieldgate Night” in 1962. Once his playing career was finished, Fieldgate served on the Board of Directors of the BC Lions. Norm Fieldgate is also a member of the BC Sports Hall of Fame.